According to the Pew Forum on Religion and Public Life, 50% of Oklahomans attend religious services at least once a week, and another 25% attend once or twice a month or a few times a year. So we behind-the-scenes elves at CodeForTulsa.org thought that churches and other places of worship would be an important Wiki Wednesday topic. Don’t let the term “Wiki Wednesday” get you down – feel free to add to the TulsaWiki for this topic at any time during the week, and catch up with previous topics if you need to. Next Wednesday, we’ll roll out a new topic! I moved to Tulsa eleven years ago, recently out of college, to take a Monday through Friday daytime job. I suddenly had time to attend religious services – that is, without having to miss work or neglect a research paper. A coworker of mine had mentioned his family attending All Souls Unitarian Church when he was a kid. It was a religious tradition I had been interested in learning more about. I looked at their website. Sounded good to me. Not only did I find services with words that aligned with my values, I also found a strong community of people who became great friends and role models. 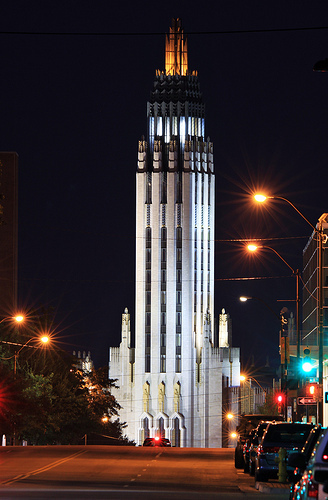 I’m sure many of our readers have similar stories of their own churches and other places of worship, so share yours on the TulsaWiki. Put yourself in the shoes of someone with beliefs or values similar to yours who is new to Tulsa or visiting and would like to know more about what Tulsa has to offer. Or, if you don’t have much personal experience with religious communities in Tulsa, you can help by taking a look at what’s already on the TulsaWiki and adding pages for faiths that are not yet represented, to help ensure that the TulsaWiki reflects the diversity of organizations we have available in Tulsa. If you haven’t already, create your account. If you have a TulsaWiki account, log in so you’ll get credit for your edits. At the top of the wiki, use ‘Search or create page’ to look for your religious organization. If it’s already on the wiki, use the ‘Edit’ button to add your own expertise to the page. If it isn’t on the wiki, create it, using the ReligiousOrganizations template. Click ‘Save Changes’ when you’re done. After creating the page, you’ll then have the chance to add your location to the map. At the bottom of the page, there is an ‘Edit tags’ button. Add the ‘religious organization’ tag, as well as any others that you think would be useful. Go to the Religious Organization tag page and discover new parts of your town! Wiki this now, and plan to join us for Tulsa’s National Day of Civic Hacking on Saturday, June 1. Register today!